Elgama DC12 data concentrator is designed to perform efficient data collection from electricity meters and transfer collected data to MDM system. 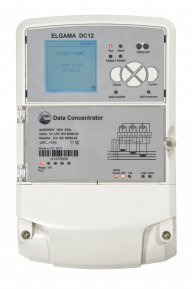 Concentrator basic version using PLC PRIME communication channel for data collection from meters. Elgama DC12 concentrator is able to use Ethernet or GPRS connection to communicate with central MDM system. DC12 has swappable communication modules. This allow provide concentrator with G3 PLC communication module for local communication along with 3G or 4G cellular communication modules for connection to MDM system. Additionally Elgama DC12 concentrator has RS 485 serial interface. It is possible to use RS 485 interface to create special channels for meters data collection. Concentrator basic version using DLMS protocol for data transfer to MDM system. Allong with DLMS protocol, DCU has ability to implement different data transfer protocols for MDM system according client requirements. DCU service application is based on WEB technology. Implemented WEB user interface allow to connect to concentrator and manage it from any computer using web browser. Elgama DC12 data concentrator has advanced internal SW architecture with possibility to modify functionality or add new functionality. It gives possibility for flexible functionality adjustment according customer requirements.